We live in an era of ‘big data’ and ‘big information’. We work in an increasingly quantified world devoid of the nuance that qualitative information provides. We also live in an era of ‘scanning’. We don’t want to read or know detail. ‘Short reports’, soundbites, video clips and tweet-driven insights are the norm. Through technology the world has accelerated to the extent that we cannot keep up with it, except when things are simple enough to absorb with the greatest ease. Enter ‘data visualisation’ (dataviz) – something everyone loves. Accessible and useful data can contribute massively to the greater good. But if not detailed, nuanced or accurate enough in collection or interpretation, it can also be a toxic recipe that feeds disaster. If we care about ‘credible evidence’, we have to engage with the values and ideologies reflected in data collection criteria, their interpretation and visualisation. We accept visual presentations such as charts to be true because they appear to present a scientific, expert, neutral point of view. I was reminded of this when I recently again read the work of Joanna Boehnert of Ecolab. She has presented and written very convincingly (see also here) about the politicisation of data visualisation. Data visualisation can be a powerful tool to create simplistic, misleading narratives – flattening out complexity; defining things in ways that change the nature of the data and hence the message it projects; setting boundaries too narrow to be meaningful; and distorting through decontextualisation. Do we look critically enough, with nuanced interpretations, at the data that inform our findings? Let us take care to be vigilant about both the light and the dark sides of the increasingly superficial, over-simplified data and information worlds on which our work increasingly depends. This is so true, I could not agree more. Excellent work, we need to look at this more. 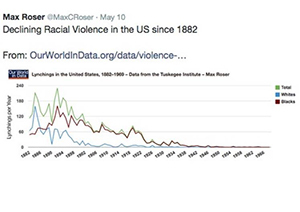 I agree with you, data visualized poorly does not inform, it obscures what is actually happening. It also divides, since not everyone can interpret charts, so the story is not told. Very apt! Data visualizations can help understand our data, basic concepts, clarify the story for others and emphasize our message. However, poor data visualization can do the opposite! Great points Zenda, thanks a lot for sharing. Also had Hans Rosling’s thoughts in mind as going through.